Bali Spa This spa is in the Sentosa Private Villas in Seminyak. Inside, there is white and wooden furniture and it is stylish and luxurious atmosphere. There are champagne & juice bar added recently. Lot of menus such as Facial full chocolate treatment using French popular cosmetic "Decleor" and Prince Treatment, etc. Moreover, you can enjoy all treatment at reasonable price. 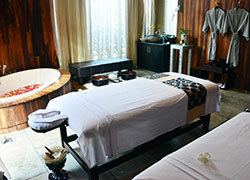 Exclusive to the Spa at Sentosa , the Symmetry Massage is a holistic approach to balance. Using signature massage techniques, the synergistic dance of therapist and guest will allow the body freedom to obtain symmetry and tranquility. Through this balance, only can the body release chronic muscle aches and pains. This traditional healing massage has been passed down for generations throughout Bali. It is an ever present part of the islands spiritual and physical beauty and has been crafted to relieve stress and tension in the body. This experience is both relaxing and therapeutic utilizing both thumb pressure and skin rolling. The lymphatic system is instrumental to the integrity of the body's immune system. Allow your body to relax as you experience a therapeutic massage partnered with several lymphatic techniques helping to release toxins and increase blood and oxygen circulation throughout the body, effectively boosting the immune system and restoring the body's natural balance. A more therapeutic massage, ideal for chronic stiffness and soreness utilizing various deep tissue techniques and stretching, incorporated for a deeper level of bodywork. A perfect treatment to release specific areas of congestion, loosen muscle tissue, release toxins, and increase blood and oxygen circulation throughout the entire body. Reflexology is an ancient technique based on the theory that the feet are reflections of the entire body. By focusing on the reflex points on the feet, energetic channels stimulate and improve blood circulation and promote a healthy, balanced self. Foot and lower leg treatment designed to relax and revive tired legs and relieve swelling. Utilizing a holistic approach to symmetry or balance, begin with a full body exfoliation to balance the skin. Now that your body is removed of excess toxins, absorb the nourishing benefits of therapeutic oil as you are carefully massaged. Soak in an herbal bath to relax the muscles and encourage further detoxification. Hydrating lotion application is the final ritual of this restorative experience. 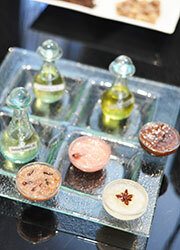 After massage with moisturizing ingredient, your body energy will be charged by rebalancing your skin and body. At first, they will moisturize your skin by cooling with aroe vera cream and lavender body mask. Enjoy mini-facial while your body is cooling down. This decadent package is recommended for those even on the strictest of diets. Begin with a body massage that is followed by a body exfoliation and a rich and creamy milk chocolate body mask. Relax as you soak in a hot chocolate bath before a generous application of chocolate body lotion. Health never felt so good! Feel the connection and symmetry throughout this couple's package. 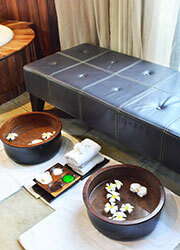 Begin with a ritual footbath to relax and prepare your body for a balancing massage. Continue with a detoxifying and invigorating body exfoliation. Togetherness in an herbal bath will bring relaxation and harmony preparing you for a cleansing facial. You will experience true balance and symmetry through this profound experience. Harbal Bath & Facial with Cooling Jade Roller. This is truly an extended opportunity to spend your day seeking and obtaining tranquility. Begin with a relaxing massage, followed by a refining body exfoliation which prepares your skin for the mineral rich body mask to follow. Balance head to toe with a cleansing natural facial followed by an express manicure and pedicure. Complete the experience by a enjoying a choice of spa cuisine which highlights healthy and great taste sensations. Indulge in our natural facial using mother nature's bounty of earths produce. A stimulating and utterly relaxing massage which stimulates the blood circulation in the head, face and ears. Therapists will massage over 20 acupuncture points on the face which follow the body meridians. Complete this facial by discovering the ancient cooling and therapeutic effects of Jade as the coolness and rolling technique of the stone closes the pores while helping to move the lymph to reduce puffiness and wrinkling. Feel relaxed from head to toe as your feet are soaked and tenderly massaged with a cooling and hydrating foot cream. Enjoy this relaxing and therapeutic full body massage. Customize your massage if you would like to focus on certain areas. 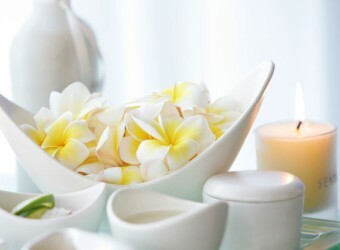 Enjoy this relaxing and back massage, natural mini facial, express manicure. Treatment includes soak, scrub, mask, cuticle trimming, gentle foot and hand massage and choice of nail polish color. In more than 2 people, I can use free pickup to the Seminyak Area. Pick up service to Other area are required additional charge. ＄6 per hour are available at the babysitter. The menu offers from children receive 10 years old. An attendant of adult is necessary for a visitor under 16 years old. Complimentary usage of steam room and Kid's play room and public shower with private locer. I thought that body waste was removed by hand massage. It was a little painful but I could feel that it also effectively work on cellulite. This spa is beautiful, however it is too luxury, a good impression without feeling diffident.